Favourite food: Braaivleis and crayfish. I would have liked to represent my country on the big stage but I wasn’t big enough to make it as a professional rugby player. Then I started refereeing to pursue my dream. Brother (Harnus) is a referee at Pumas. Father was a referee and is currently a referee coach/reviewer in SWD. 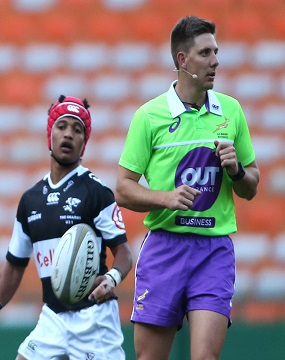 If you love the game and have a passion for rugby, become a referee. You have the best seat in the house. Sport is my job, hobby and my life. I like to exercise. I was Hoerskool Bultfontein's Headboy in 2007.